40 water fasting with 10 days of juice fasting. Ten days of juice fasting followed by 40 day of water fasting. I was 50-60 lbs overweight from where I was used to being in high school. I thought my metabolism would allow me to continue eating whatever I want for life. I began to spend most of my time in front of the computer and physical exercise was very limited. I would eat to deal with stress, boredom, or just for an extra “sugar high.” I felt God speaking to me about 1 year and a half earlier that I needed to exercise to fulfill my calling. At the time I didn’t understand what this meant, and I neglected to do this. That’s when I gained about 50 lbs. in a year. Other people began to take notice of my weight gain, but I mostly ignored it with baggy clothes and not going swimming. One day I went to buy some new pants (because my former pants didn’t fit anymore), and it dawned on me that I had gained 8 inches on my waist from where I was used to being. At this point, I heard a message by someone who gave Biblical reasons why health is important (along with his testimony). This motivated me to make the changes in my life toward weight loss. I then began to work out with riding my bike, walking on the treadmill, and jogging etc. I began to cut out most meat and dairy out of my diet and eat more raw fruits and vegetables. Through these disciplines I lost 37 lbs. in close to 2 months! It was from there that I decided to do a 10 day juice fast, immediately followed by a 40 day water fast. With God’s grace and a body that was detoxed well from exercise and a healthy diet; I found that the first 30 days of this fast were fairly easy. During the first thirty days I was walking miles a day and going up and down hills around Jerusalem. I had plenty of energy and strength. The final 10-15 days of the 40 day water-only fast began to be more of a challenge for me. I began to feel less strength for walking long distances and some light headedness. But I decided that I had come this far and so I would not go back. I took that as a sign that I was to rest and spend more time with God. As I did this, I found the grace and strength to keep going. My body felt so clean and I was surprised by how few times I really had “hunger pains.” During this period of my fast, I realized that I had to change my belief systems about the way I look at food so I can break my fast properly. I wanted to know more about the difference between starvation and fasting. This is when I found Tom Coghill’s fasting website that gave me information to confirm what I was already learning, and to teach me many fresh perspectives as well. I lost 50 lbs. during the 50 day fast and I lost 87 lbs. overall in 3 months! I feel better, have more energy, and am back to the fitness level that I was in high school. I broke my fast with mostly raw fruits and vegetables and the feeling was awesome as I tasted the variety of flavors of God’s foods in their natural state. What was even more important to me was the peace of knowing I’m doing the Father’s will. Jesus (Yeshua) overcame temptation and walked in a new strength and power after His 40 day fast. And it was a joy for me to be able to walk in the Master’s footsteps to gain discipline over self, spirit, soul, and body. Thank you for your inspiration. I am on day 13 of a water fast, and feeling a bit discouraged. But your story restored my faith in God’s work. Thank you. 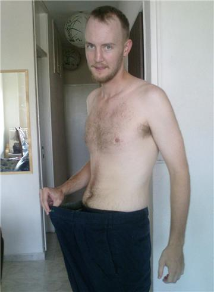 hi tom i am currently doing water fasting for 8 days and doing great i am 28yrs old 5.2 and weigh 70kg i want to be 50kg by next month i started off with 88kg. You can start the Atkins diet after you break the fast. The breaking period depends on the length of the fast. On day of breaking per day of fasting is a safe amount. The concept of cutting starchy foods is solid but to me the protein consumption is too high. Try the Fast-5 concept that I posted on the front page. You could do it in combination with Atkins. To me the problems of weight gain is the number of hours of excess calories becoming fat per day. I have read your short Testimony on the fasting support page. I see your compassion on this new fast that you have begun and wish you all the best on this new fasting journey, whether” it be for weight loss, mind, body, or Spiritual” reasons, we are all here to help and support you. We are on the fasting progress report page if you would like to join us there. Juice fasting is safer, easier, and more therapeutic than water fasting. I have a sister that did 11 days water fasting, she was advised to do so because of her illness , she have ulcertive colitis where she always bleed and the medication was not working , so she was told by a natural health professional that water fasting can stop this disease . unfortunately she kept bleeding till the 11th day of water fasting and she couldn’t continue as she had major chest pain and trouble in breathing ,she was advised to stop the water fasting,and start a juice fasting.I’m really worried about her doing all this , i need some advice , she doesnt need to lose weight cz she is already skinny even before water fasting and i was shocked to see her after that its like she’s being in a starvation !, and she have become so weak like old people. I know this would subject will interest you as you want to cure chronic diseases with fasting and herbs,and that’s what the other doctor was trying to do ,but didn’t work he said that her situation is rare . Hi Joe, Tom is on a mission in New Guinea, inoculating malaria and TB victims. He checks in from time to time when he is near civilization. I can try to help. Water fasting was the WRONG advice. Juice fasting is the way to go. Water CLEANS. Juice HEALS. your sister health ok now? Hey, im planning to do a 50 day spiritual water/tea- fast. This is my first time, but i feel mentally prepared to do this, i feel that this is the right time for me. Also I wanna get advantage of the health- related benefits of water fast. Does anyone have any advice for me? Like how to STAY AWAY from food and say no ? I have a eating disorder is it ok for me to do water or juice fasting? I’ve made my mind up to fast not to loss weight but I need God’s help in all areas of my life, I Want to know Gods will for my life and that of my family. I need a fast buddy, I plan to go on 40days of water fasting starting ash wednesday 13th Feb 2013.